The post-truth era bears severe risks for human rights practice, both in the analog and the digital sphere. However, it also reveals a very important fact: humans are much more affect-driven than we assumed; and this has severe consequences for human rights practice. To sum up, humans have a social-intuitionist nature. They base their moral judgment mainly on intuition and social influence and not on reason – and this finding has severe consequences for the way we approach people in human rights work. Haidt, J 2001, ‚The emotional dog and its rational tail: A social intuitionist approach to moral judgment‘, Psychological Review, vol. 108, no. 4, pp. 814–834. Haidt, J 2013, The righteous mind. Why good people are divided by politics and religion, Vintage Books, New York. Hume, D s.a., A treatise of human nature. in two volumes. 2, Dent, London. Research on attitudes is focussed on physical attitude objects and the like. However, especially against the background of Trump and Brexit, attitudes toward social issues like human rights need to get more attention in research. The most quoted definition of attitude is the one by Alice H. Eagly and Shelly Chaiken defining attitude as „[…] a psychological tendency that is expressed by evaluating a particular entity with some degree of favor or disfavor.“ This definition is similar to the common understanding, defining an attitude is a positive or negative predisposition toward an attitude object. Virtually anything that can be evaluated can serve as an attitude object. This includes concrete objects, abstract concepts, (group of) people, classes of entities, behaviors, policy issues, and so forth. However, an over proportional amount of research on attitude focusses on products, attitude towards concrete objects, and the like. Therefore, Maio & Haddock identify the following challenge: „The challenge is for persuasion researchers to collect more data on applications to social issues […]“! From a social scientist’s perspective these are the relevant attitude objects which will make a difference over time in the society as a whole. I aim at contributing to this underrepresented part of attitude research by focussing on a social issue: the basal moral human right not to be harmed. Why the right not to be harmed? First, as Jonathan Haidt pointed out in his TED Talk from 2008, harm is one of the moral roots people all over the world agree upon. Second, due to this global agreement, the it can serve as a basal moral right in the sense of an inalienable, universal human right. By looking at the right not to be harmed as an attitude object, possible strategies how to change a negative attitude toward this right can be examined. I all individuals had a strong and positive attitude toward the right not to be harmed (and behave in accordance with it), the world would be a better place. Since the Arab Spring the digital shift in the struggle for human rights has become obvious. Global Communication Technologies – mainly social networking sites – were said to have played a key role in the people’s uprising by providing the formerly missing possibility to connect to like-minded people and therefore take a stand for human rights. On the other hand, the World Wide Web has also made it easier to limit and violate human rights. This discrepancy in the perception of risks and opportunities of the web for human rights entails inter alia the following questions: Does the Internet really enable human rights? Which rights – except for the right to freedom of expression – are influenced by the communications revolution? Do we need new human rights in the digital age? Should the right to access to the Internet be recognized as a human right? Based on introductory sessions about the philosophical and political basis of human rights on the one hand and the structural shift in global communication to “bottom-up” approaches and “mass self-communication” on the other hand, the abovementioned questions will be addressed by discussing latest research results and specific examples. The aim of the seminar is to provide a basic understanding of human rights in general and the influence of global communication on the struggle for human rights in particular. Check out this great presentation of John Tasioulas about his forthcoming book an human rights from an orthodox respecively moral point of view @Radcliffe Institution – Harvard. Consequently, to focus on the moral perspective entails the necessity to understand the individual as both, possessor and addressee of human rights norms. The arguments that are put forward in order to strengthen the idea that the addressee of human rights is the state, are referring to the fact that a lot of articles in human rights declarations do hold directly against states and their governments. But this argument can be turned against itself by referring to the findings already made in the two former paragraphs: The existence of articles that bind states can be understood as another evidence, that these articles belong to the political perspective and do not belong to the moral basis of human rights and the therewith universality. As Wellman (c.f. 2011, pp 25–26) states, these political rights are derived from more fundamental basal rights. For Wellman, these basal moral human rights are “those that stand at the base of the system of moral human rights and from which more specific human rights are derived” (Wellman 2011, p 33). It is exactly this universal basis, which has to be defined and spreaded to improve the state of human rights worldwide. Benhabib, S 2008, ‚The Legitimacy of Human Rights‘, Daedalus, vol. 137, no. 3, pp. 94-104. Menke, C & Pollmann, A 2007, Philosophie der Menschenrechte zur Einführung, Junius, Hamburg. Nickel, JW 2007, Making sense of human rights, Blackwell Pub., Malden, MA, Oxford. Wellman, C 2011, The moral dimensions of human rights, Oxford University Press, Oxford, New York. By developing the theory “the right to justification” and applying it to human rights, Rainer Forst combines universal and particularistic views by claiming to be universal in theory and still particularistically applicable. (Forst 1999a, p 68) Hereby, he strikes a balance between the two poles of universalism and cultural relativism which dominate the discourse on human rights theory. All norms meant to be enforced, including human rights, have to be reciprocally and generally justifiable. Reciprocity here means that the author must not assert a claim that is denied to others. By generality Forst means that all affected parties of a norm must be able to equally share the reason for the norm in question. (cf. Forst 1999, p 82; Forst 2013, p 140) The criteria of generality is crucial to reject arguments from the cultural relativist side because it implies that a culture has to redefine its norms as soon as the norm is not equally shared by every member of the culture. Consequently, there is no external pressure on cultural change. Concerning human rights, this means “that human rights are meant to ensure that no human being is treated in a way that could not be justified to him or her as a person equal to others” (Forst 2013, p 39). According to Forst, one has to take as a given that there is only one basic human right: the right to justification. Thereby, this does not mean that the other human rights can be developed from this right – it rather serves as a main guide for the construction of concrete human rights. Consequntly, Forst’s approach meets the criteria set by himself: The right to justification is „interculturally non-rejectable, universally valid, and applicable in particular cases“ (Forst 1999b, p 36). Forst, R 1999a, ‚Das grundlegende Recht auf Rechtfertigung. Zu einer konstruktivistischen Konzeption von Menschenrechten‘ in Recht auf Menschenrechte. Menschenrechte, Demokratie und internationale Politik, eds H Brunkhorst, WR Köhler & M Lutz-Bachmann, Suhrkamp, Frankfurt am Main, pp. 66–105. Forst, R 1999b, ‚The Basic Right to Justification: Toward a Constructivist Conception of Human Rights‘, Constellations, vol. 6, no. 1 [01 September 2014]. Forst, R 2013, Justification and critique. Towards a critical theory of politics, Polity, Cambridge. 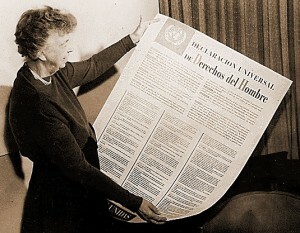 “The General Assembly proclaims this Universal Declaration of Human Rights as a common standard of achievement for all peoples and all nations, to the end that every individual and every organ of society, keeping this Declaration constantly in mind, shall strive by teaching and education to promote respect for these rights and freedoms […]”. This statement is a part of the preamble of the Universal Declaration of Human Rights (UDHR), the most widely accepted declaration of its kind. It clearly proclaims the universality of human rights and it is taking as a given that “every individual” is aware of its universal rights and shall be willing to promote it. The current scientific debate about the universality of human rights can be structured what I call a horizontal and a vertical dimension. The horizontal dimension is about the different ways one can approach the topic “human rights” from different disciplines. It is threefold, consisting of the moral question about its normative ideals, the political endorsement of a concrete conception of human rights and its legal implementation (including the actual enforcement on the ground). The vertical dimension is concerned with the fundamental question whether human rights are universal or particularistic. All horizontal perspectives of human rights research raise different questions concerning the vertical division between universal and particularistic approaches. If the UDHR demands to be universal in the way that every individual shall promote respect for these rights and freedoms – as stated in the preamble – the nature, the understanding and the view of each individual has to be focused on much more. Only if everybody is really convinced of the universal idea of human rights, the latter will actually become universal. For the last months I’ve been reading a lot about the research on values in change. What I’ve been looking for was a concept for the reasons for the change of values – but there is hardly anything. Most scholars point to the fact, that there are various reasons for the changes and that one cannot pinn them down. For my PhD I wanted to point out that digital transcultural communication via Web 2.0 would lead to a change of values – in other words: One reason for changing values must be communication (speeded up by Web 2.0). Due to the fact that there is no answer to the quesiton of reasons for changing values I won’t be able to follow this path anymore. I will leave the debate of values in change aside and concentrate on the debates of universal human rights and the communication revolution triggered by the Internet.